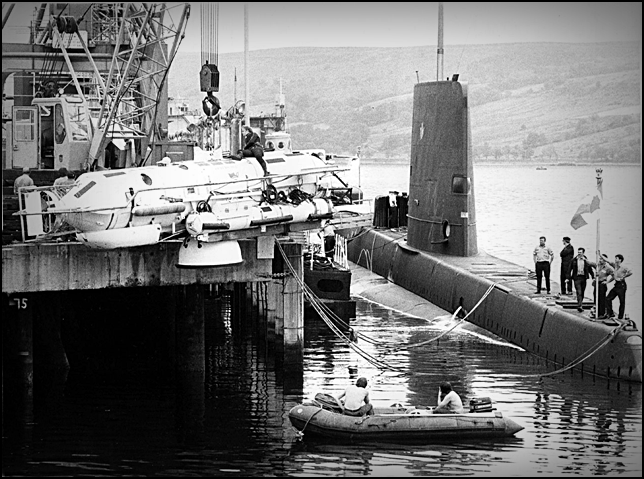 A great picture of Ojibwa at the base in Faslane Scotland getting ready to conduct trials with the DSRV (Deep Submergence Rescue Vehicle) that is dangling at the end of a crane before being lowered into the water. I was on board for this exercise, it was quite the thing, to have the DSRV attach itself to our forward escape hatch, make a water tight seal, then eventually open the escape hatch. If I do remember correctly, the first thing that was passed through was a can of Canadian beer….! A lot of work went into that, the way the DSRV approached us, the intricate positioning to make sure that their skirt was directly above our escape hatch. The many attempts to make a seal and finally the opening of the hatch. In August 1975, HMCS Ojibwa becomes the first Oberon class submarine to test the viability of commercial rescue vehicles for Royal Navy military purposes. Ojibwa is seen here during held in Gare Loch in Scotland. Ojibwa crew member Paul Connolly is seen here straddling the Vickers Oceanics DSRV L1 while his colleagues watch from the casing. When contact is achieved with the submarine held in place by thrusters, the water in the skirt is reduced to one atmosphere pressure [14.9 psi] giving a positive lock on between the two boats. Water in the transfer skirt can then be drained into the submarine and the hatches of both boats opened for transfer of men or equipment."